A warm greeting at the door! We gather for Sunday worship at 10:30am. You might want to arrive a bit earlier to chat and choose a seat, perhaps with a lovely view of our accredited green sanctuary grounds. Most folks dress casually; some choose to be a little dressy. We welcome people of all abilities, ages, races, ethnicities, genders, sexual orientations, and creeds. We welcome and affirm people of all abilities with accessible grounds and services. Greeters and ushers are available to assist you. 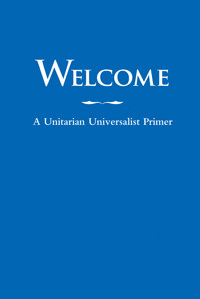 Unitarian Universalist worship varies by congregation. Our congregation’s Sunday worship is informal, friendly, and eclectic – sometimes quiet, sometimes loud, but always musical. We do love to sing! Sometimes the music is traditional, sometimes contemporary. There’s almost always laughing and applause, but sometimes there are tears. The birds and squirrels outside our windows sometimes distract us, and that’s okay! From time to time, services incorporate holiday celebrations, plays and pageants, longer musical performances, child dedications, coming-of-age ceremonies, and welcome ceremonies for new members. Please do! We have a fun and welcoming group of kiddos already, so we hope you’ll feel right at home. All ages begin together in the Sanctuary for the start of worship. After the story for all ages, children are invited to participate in age-appropriate Religious Exploration in the Fellowship Hall, with childcare for infants and toddlers. Children are also welcome to remain in the sanctuary. Our sound system broadcasts to the Fellowship Hall living room, so you can also pop back there if needed and not miss any of the service. Just let us know how we can assist. Once a month, we stay together in the Sanctuary as an inter-generational community. Using story, song, and ritual, these services engage the whole family in worship together. Our worship schedule shows when inter-generational services are scheduled. Childcare is available for infants and young toddlers every Sunday, including the inter-generational services. A few times a year, we have celebrations or events after the service and during the week for children and families. Join our mailing list and follow us on Facebook to keep updated on special happenings.